A slogan reels people in, and if you want referrals, you have to grab people’s attention. Here’s a great list of catchy referral slogans. We’ve all been reeled in with a fun slogan. It’s what brands use to catch someone’s eye and make them think for a second. It’s also what a simple association that helps people connect with a brand. What is a referral slogan? You may be more familiar with the term referral headline or catchphrase. A referral slogan is simply the phrase or quote used to explain the benefits of joining a program (you may also use it in your referral messaging too). It’s typically the catchphrase used to pique interest in your program. For example, you may just use the referral slogan when promoting the program via email or online. This slogan is usually what drives people to your program landing page where they can then read more information about the program and sign up. It’s also catchy referral sayings that will keep word of mouth flowing. This is your chance to gain attention and get people interested in your referral program (and any good referral marketing guide will touch on this). Your slogan acts as a tell-all for you. It can give someone the general idea of what’s expected and what someone will get out of it. You’ll likely want to promote your referral program everywhere you can. But, you most likely don’t want to talk about it in-depth in your promotions. The referral slogan can help you cover the main points of your program, without overwhelming viewers. If you think about it, the referral slogan is what will help your word of mouth increase. As it’s the catchy phrase that will help encourage people to sign up for your program and share you! Now that you understand what a referral slogan is, you should know the components that make it up. Keep in mind that these types of slogans are relatively short. However, they are usually packed with information. If a referral program offers an incentive, you’ll likely see it in the slogan. When people see the dollar signs or the word free, they are instantly intrigued. If the incentive is listed, you’ll likely state how to earn it. One word alone can cover this component, for example, “give” or “share”. This one isn’t used quite as much, but when there is no incentive or the business wants to spin away from traditional slogans, you’ll see this component used. It usually helps explain why the person should refer, “Don’t keep us a secret”, or “Be a hero”, etc. are used in this sense. These types of statements can be added and combined with the parts mentioned above to create an insightful slogan that packs a punch. Let’s dive into some slogans to see everything we have mentioned put into action. One of the most common types of referral slogan used. Those that take about the reward really get people’s attention. Why? Because people want to know right away whether joining and sharing is worth their time. In the example above, the Colourpop referral program uses a simple 4-word slogan. It covers the incentive and how to get it. Here are other referral slogans that follow the same strategy. Share $10, earn $15 for yourself! Sometimes you’ll see a brand use some extra fluffy words that act as a friendly PSA. These feel-good words help motivate people to share. You’ll find for the most part the message drives itself so stating the incentive doesn’t matter. 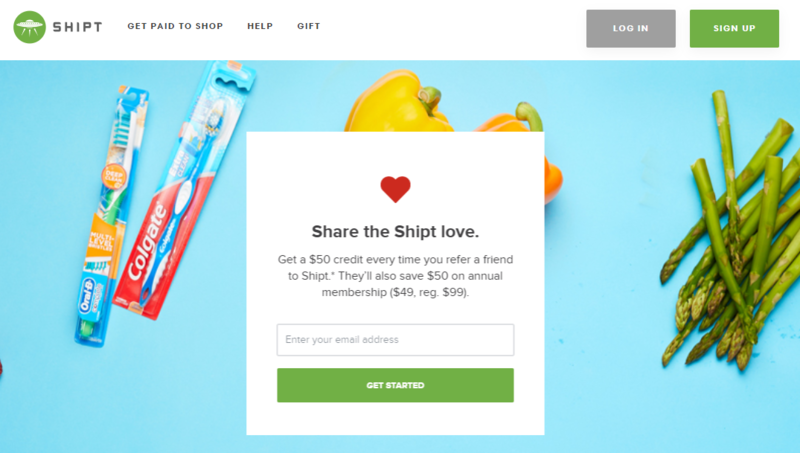 Shipt’s referral slogan uses the power of love to drive the message. It is then followed by a descriptive text that further explains the program and benefits. But the catchy slogan does a great job at piquing interest on its own. Here are some more slogans that follow the same strategy. Refer & Earn. Share. Get Paid. Repeat! Want to help each other out? Do it for your friends! Sometimes an easy way to gain attention is to use the word free. If your incentive offers something free, you may want to use it as a driver in your referral slogan. That little word really does get people amped. 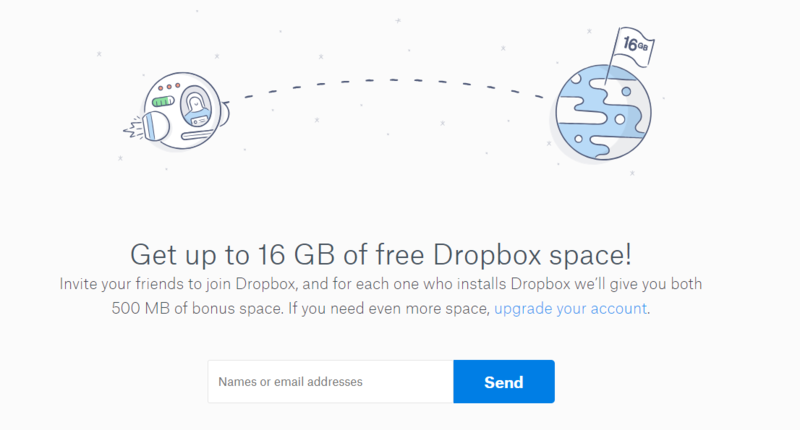 Take Dropbox’s referral program, for example. They have one of the most well-known programs in town. And all they offer is a little bit more free space for people to store their files. It’s what people want, and it really works. Similarly, Uber gives out free ride credit, which in most cases means they offer a free ride, and their program is equally as popular. Here are some other slogan ideas that follow that same rule. As you can see, you can grab someone’s attention in a variety of ways and that it’s an important factor in the health of your program. If you use the right driving force for an effective referral program, you might just get the referral traffic you’ve been dreaming of. The trick is to play around with it to find that sweet spot. You may want to try using your incentive as the driving factor. If that doesn’t work, you may want to try switching up the headline to use more feel-good words. Which referral sayings catch your eye?